As of August 1st 2018, Deskpro will no longer support Internet Explorer 8, 9 & 10. Internet Explorer 8, 9 & 10 have reached ‘end of life’, meaning they’re no longer supported by Microsoft. 'End of life' means the browsers will no longer receive security updates or any other kind of patches, leaving those running them wide open to new vulnerabilities. Internet Explorer 8, 9 & 10 will also struggle to deal with the complexity of today's more sophisticated software applications - including Deskpro. In turn, this makes it untenable for us to ensure that our product is secure and functional for you on Internet Explorer 8, 9 & 10. Unfortunately, as of August 1st 2018, Deskpro issues of any severity found to occur exclusively in Internet Explorer 8, 9 or 10 products will not be resolved. We recommend that you upgrade to a more modern web browser if you're using Internet Explorer 8, 9 or 10. If you have customers who are still using Internet Explorer 8, 9 or 10, you might want to let them know the this might cause problems using or interacting with Deskpro in the future. Contact us. We'll be more than happy to help. When we release new versions of Deskpro, we usually assign them a number so we can communicate with our customers about each update, release or version accurately. We're going to change the way we number those releases to make things easier for everyone. How were releases numbered before? At the moment, we currently number our releases as 'Deskpro 5.15.0', or similar. The numbers in this name refer to firstly, the version of Deskpro as the number 5. Then the release number of that version as the number 15. And finally, the minor update number as the number 0. How will releases be numbered now? Now, we're going to be changing the way we number releases to 'Deskpro 2018.15.0', or similar. The numbers in this new name refer to firstly, the year of release. Then the release number of that version as the number 15. And finally, the minor update number as the number 0. With the new numbering system, you'll be able to have a better idea of where in the product update lifecycle Deskpro is during any given year. You'll also have a better idea about where you're at in relation to the latest version of Deskpro if you're running an on-premise deployment of our software. At the end of the day, it just makes for better housekeeping! If you have any questions, please don't hesitate to get in touch. Do you know what you're looking for when it comes to help desk software for small businesses? Here are the three things every small business should keep in mind when on the hunt for a new solution. Running and managing a small business is no mean feat. You need to balance limited resources, restricted budgets and the ability to innovate. One of the most effective ways for small businesses to differentiate themselves is through the quality of support they deliver to customers. Competitive products and pricing is still important, but a differentiated level of customer support is absolutely essential for victory in today's battle of the brands. Customer retention is just as important to growth and sustainability as acquisition, and the support experience remains a key loyalty driver. That's exactly why small businesses necessarily require tools that allow them to add value through quality support. That's why small businesses need help desk software. As your business grows, even modestly, using Outlook and Gmail to manage support becomes untenable. There are a whole number of help desk software solutions available on the market today, but finding one that truly caters to the needs of small businesses remains difficult. Leading helpdesk providers offer a range of feature sets with an even wider range of pricing plans. That's why finding a help desk for a small business can feel like a lot like navigating a minefield. One of the most critical restraints for small businesses is budget. When it comes to help desk software, this limitation can cause quite the headache. Some leading help desk software providers offer pricing structures that accommodate freemium and enterprise options - and everywhere in between. This is great in the sense that it allows small businesses to acccess industry-standard help desk software, but there's a caveat. These kinds of 'free' pricing plans only offer very basic functionality, which quickly becomes very expensive. This tends to happen because some help desk software providers lock core functionality behind more expensive pricing plans. As a small business, you may begin with very simple needs and one or two agents, but as circumstances change or your company grows, you may find it extremely costly to scale your help desk software alongside commercial growth. Help desk software for small businesses needs to be affordable, now and in the future. Make sure you find a provider that won't force you to cough up extra for access to simple features. If there's a problem with the more expensive providers, surely that means the totally free solutions are the way to go. Not quite. This creates a totally new problem for small businesses. Using free or open source help desk software can mean hidden costs rack up through complex installations, configurations and maintenance needed from highly-trained developers. Free help desk solutions also lack the features you need to provide genuinely meaningful customer support that is so crucial for small businesses. Some solutions marketed as 'help desk software' can be nothing more than glorified email management systems, with little to no support for automation tools and a joined-up self-service portal. Help desks with features like fully-integrated self-service are essential for small businesses. It's truly the most effective way to scale your support with limited staff and resources. Self-service means you can help your customers to help themselves by offering instructional content and FAQs whilst reducing ticket volume. When it comes to help desk software for small business, a fully-featured help desk that's supported by a team of dedicated staff is absolutely key for success. This leads us on to the final pillar of great help desk software for small businesses. We know what it's like to be a small business, and we know how painful it can be to evaluate new software. As a budding company with exciting prospects on the horizon, you need help desk software that comes with all the resources you need to succeed. Sometimes, highly-available and friendly support can make the difference between a successful help desk deployment and a failed one. Other leading help desk providers often fail to give their customers the attention they often need and deserve. When examining help desk software for small business, ensure you invest your time and money in a provider that takes the needs of their customers into account - no matter how small they are. At Deskpro, we pride ourselves on being able to meet criteria we think are important when it comes to help desk software for small businesses. That's why we offer full access to our fully-featured helpdesk for just $30 per agent per month, and strive to be there for our customers every step of the way. But don't just take our word for it, check out our pricing, features, or read what our customers have to say about us. Live chat and the help desk have co-existed for well over a decade now, but organizations are only just starting to realize the potential of integrating the two properly. What exactly is live chat help desk software? Most of us are familiar with at least some type of live chat help desk software. Essentially, it's a messaging application that allows customers (or potential customers) to contact your company. This is usually done through a widget on your company website, by which customers and support staff can engage in a 'realtime' text-based chat conversation. To many businesses, live chat is now considered as important a channel as phone or email is to overall support. Live chat help desk interactions have a some significant positives. Customers love the speed and accessibility, whilst agents appreciate the parity with consumer messaging services they're already used to using. Live chat is also way more scalable; allowing agents to juggle multiple chats at the same time without negating the customer experience. What should I look for in live chat for my help desk? When customers visit your site or portal looking for support, you can make it super-easy to find the best agent for the job with custom chat fields. Custom chat fields licit and record information from customers who want to initiate a chat. For example, you can use custom fields to determine the nature of their support request before they're connected to an agent. Coupled with business rules and intelligent workflows, you can ensure that customers are routed to the best agent or department to solve their particular issue. Sometimes, when customers reach out to chat with your organization, it helps to equip agents with information regarding where customers have been on your site before engaging with you. For instance, a customer could be spending a lot of time on your product pricing web page, letting the agent know that they might have a related request. User journey insights allow your agents to understand and preempt queries effectively - promoting efficiency and a frictionless customer experience. Agents do a better job when they're equipped with all the facts about the customers they're supporting. This is exactly why CRM chat integration is so powerful. From within chats, agents can view entire customer profiles, and truly understand their ongoing relationship with your brand. Access to full message history and other pertinent customer information means agents can deliver highly-personalized support interactions with ease. Once customers and agents are engaged in a live chat, time-to-resolution is key. Agents can be involved in hundreds of chats each day, so using time-saving tools really makes life easier for everyone involved. Let's take a look Deskpro's Snippets tool as an example. Snippets allows agents to create, use and manage pre-defined support responses in chats and tickets. The right tools for the job like Snippets means you can boost productivity, eliminate errors and delight customers - all in record time. Sometimes an agent isn't able to quickly resolve a customer issue during a live chat - but their colleague might be able to. This is where multi-agent chat comes in. With Deskpro, agents are able to simply add colleagues to live chats. This means that if the initial agent is struggling to find a solution during a chat, they can easily team up with available colleagues to deliver the best support possible. No matter how effective your agents may be, not all chats are solvable in the first instance. In some cases, issues that customers raise during chats need to be escalated or explored further before resolution. With a single click, agents can capture all the information from a chat interaction and turn it into a simple ticket within the help desk - ready to be solved like any other. A full-featured live chat help desk enables you to create meaningful human connections with your customers. For just $30 per agent per month, you can get full access to all Deskpro features and channels. Check out the powerful live chat features we offer as standard. The multi brand help desk is an invaluable customer support tool for organizations of all sizes. So, what's the most affordable way to get access to multi brand functionality? For so many of today's organizations, the multi brand help desk is nothing short of an absolute lifesaver. Looking after a number of different brands, products or audiences using the same help desk and staff, massively consolidates otherwise costly overheads. Regardless of how many differentiated help desks one organization might need to manage, they usually all share one vital requirement: great customer service. To achieve this at cost, a multi brand help desk is a must. Without it, you'd end up paying for (and managing) multiple instances of a single help desk. What is a multi brand help desk? Essentially, multi brand functionality allows you to operate more than one support portal in a single help desk deployment. This means you can also offer unique content and unique branding for each support portal. Being able to use the same support software and staff whilst retaining control over workflows, branding and content across multiple portals is a big plus for many organizations who need a help desk that scales. Who needs a multi brand help desk? Provide support to your customers as well as internal staff. Give VIP customers a support experience that differs from the usual. Offer differentiated support for the range of products you provide. Create portals to reflect the different brands in your organization. Offer unique multilingual portals aligned to the particular region customers are visiting from. Run experiments to discover which support portal processes, content and layouts get the best engagement from customers. Why is multi brand usually such an expensive feature? The first and most obvious use case when it comes to the need for a multi brand help desk is always enterprise-level organizations. Global companies of a certain size often have a huge appetite for the capability to provide sophisticated, localized and customized support to different customer segments. Whilst it might seem apparent that most multi brand use cases are associated with enterprise-level organizations, there are no shortage of startups, solo entrepreneurs and SMBs who could benefit from this functionality. You might be reading this article because you're one of them. It's true that most companies start off with quite simple needs when it comes to customer support - a couple of agents, a single support portal, and a modest amount of largely undifferentiated customer support requests. As these companies grow, or when their circumstances change, some might find it hard to scale their support operation with multi brand without breaking the bank. To get access to multi brand functionality with some leading helpdesk providers, it can cost you an amount that might seem expensive even to bigger corporate or government organizations. For instance, your entire support team might only answer relatively few tickets across multiple portals whilst not even needing or using the multitude of other enterprise features that comes with the price tag. How can I find an affordable multi brand helpdesk? High prices for access to widely-coveted features can sometimes leave a bitter taste in the mouth of those who want multi brand capability - but don't want to fork out for an enterprise plan. That's why we offer our customers unlimited multi brand capability with all the frills of Deskpro for just $30 per agent per month. Part of the value any organization delivers to customers is the ability to innovate and remain responsive. Many companies of all sizes take great measures over long periods of time to do so, and therefore often need to centre their support operation around providing services under different brands for various market segments. Check out our multi brand features, or our super-simple pricing plan to discover more. Do you need an open source help desk or an alternative option? There are a number of pros and cons to most things, and open source help desk software is no different. This article has been written to guide you through the benefits and pitfalls of relying on a help desk built with open source code, and what the alternatives are. What exactly is open source help desk software? As a company experiences growth, managing customer support from a shared email inbox becomes simply untenable. As a result, many organizations look for a ticketing system or help desk in order to effectively support their customers. Without a sizeable budget, lots of organizations look for open source help desk software - built on completely free and openly available source code. Whilst this might sound appealing, the open source approach has certain drawbacks that you ought to keep in mind before investing in a free help desk. One of the biggest pitfalls when investing in open source help desk software is the hidden costs it can incur as time goes on. Many open source options available are completely free to download and use, but quickly become expensive when you calculate the cost of complex install processes, tricky configurations and constant maintenance needed from developers. A great thing about open source help desk software is that it gives you complete freedom to customize it to match your specific organizational needs. However, it's not uncommon for free help desk providers to publish 300+ page long manuals that are nothing short of daunting for non-developers. When it comes to the freedom open source solutions have to offer, it only really pays off for those with the necessary in-house technical skills, time and resources. Because of the commercial reality behind open source help desk software, it can be very difficult for a provider to offer any meaningful level of support when things go wrong. With more popular solutions, there are terrific user communities that offer hands-on support to one another. The unfortunate reality is that without dedicated support, any bigger issues you might experience will take a lot longer to resolve than they would with a paid help desk provider. Another typical grumble you're likely to hear from users of open source help desk software is the absence of those super-useful features. These could include anything from time-saving automation, to the ability to readily adapt the help desk to suit already-existing internal workflows and processes. Help desk providers with paid-for products enable them to invest profits back into improving their software. A lack of features isn't just an impairment to the value you get from open source help desk software; it can also negatively impact both the employee and customer experience. Without a full-featured help desk that's backed up by a dedicated team of bug hunters and support staff, you might find the product can become tricky for your team to navigate. Not only does this frustrate staff, but the trickle-down effect it has on the customer experience is simply non-negligible. What are the alternatives to open source help desk software? If you're looking for a low-cost, flexible and robust help desk, Deskpro includes an open platform and API - so you can make changes and adapt freely. Developers and frontline support staff love using Deskpro for the reason that it's easy to customize, integrate and use. What's more is that investing in Deskpro doesn't mean breaking the bank. Unlike other leading help desk providers, we offer a simple rate of just $30 per agent per month for access to a fully-integrated help desk that's packed with hundreds of features. Don't settle for a 'free' help desk that's going to cost you more in the long run. Take a look at our developer page for more information. What is a shared inbox, and do you need one? Email isn’t dead, in fact - it’s unlikely to go away any time soon, hence why you may be looking for a shared inbox solution. Whilst you could make a strong argument that email is our last opportunity to communicate meaningful longhand in a world of busy tweets, chats and snaps - for any growing business, it’s still an incredibly tedious necessity. Amidst a quest for a more robust alternative to email, this short article is designed to help you determine what you and your customers might need. According to Adestra's 2016 Consumer Adoption & Usage Study, nearly 68 percent of teens and 73 percent of Millennials said they prefer to receive communication from a business via email. In addition, a recent survey by Statistashows the number of email users worldwide is forecasted to rise to 2.9 billion users by 2019. As widely adopted as email is, it’s still a far from perfect means of communication - especially between businesses and their customers. For many, a handful of sales, support and other departmental email addresses might be a simple and effective way to manage customer support through a shared inbox - but never for long. As your business starts to grow, the complexity of managing support over several shared email or shared inbox accounts between a number of staff quickly becomes too much for even the most adept customer champions to handle. Visibility is completely limited, and internal communication becomes incredibly tricky. Following endless threads with multiple fwd, cc, and bcc emails also adds another layer of unneeded hassle. In the best case scenario, you’re wasting valuable time and creating frustration for everyone involved. And the worst case? You’re letting customer issues slip right through the cracks - creating real problems for your brand and business. So you need a solution, that’s for sure. But what, exactly? Do you need a shared inbox? A shared inbox allows you to manage shared addresses your customers use to contact you - in one single place. All customer replies and requests are automatically converted into tickets that are easily tracked, assigned and indexed. This might sound like a dream to anyone who’s been managing support through Outlook or Gmail, but what many small businesses don’t realize is that shared inboxes typically lack the functionality critical to truly efficient customer support. At Deskpro, we spend an overwhelming amount of time talking to our customers who came to us because they say they want a shared inbox. They always have one thing in common: they actually need a helpdesk. They want swift, innovative solutions that make customer support way more efficient. They need visibility into how support is being handled, and insights on how to develop their approach to customers should be readily available. View and customer conversations in full; complete with message history. This creates a highly-visible support environment for your business, which increases accountability, provides a baseline, and ensures issues don’t fall through the cracks. See at a glance what needs to be done, the status of various issues, and who’s working on them. Organize, filter, manage and label customer conversations. See exactly what you need to know at-a-glance, and rank customer issues in order of urgency or priority. Spend less time trawling through emails you’ve been CC’d in, and more time on what matters to your business. Never type out the same reply to different customers ever again. Create, manage, and use predefined responses when replying to customers over email or chat. Save heaps of time and improve the quality of your support with dozens of other handy automation tools. A helpdesk is perfect if you don’t like sharing your personal email inboxes with others, but want everyone to get stuck in with customer support. Multiple people can work on the same issue, and can keep progress visible through communicating via internal instant messaging and ticket notes. Understand important factors like support workload, response time and resolution rate. Metrics like these, that you can’t get from a shared inbox, quickly provide you with a perspective of how you might need to support your customers better. The bottom line is: we’ve all had enough of email, but a shared inbox is not the solution. If you think you’re ready to move away from join thousands of businesses who are benefitting from using Deskpro to manage their customer support, go ahead - give it a try today for free. Sign up for your free 14 day trial of Deskpro here. As a result, Deskpro is working ahead of time to maintain and improve the privacy and security of our product for you. Proactivity at this stage means Deskpro will be ready and compliant well before the May 25 2018 deadline, making it easier for you and your organization to achieve GDPR compliance - without the headache. The new comprehensive data protection law applies to any company based in the EU, or selling/marketing in the EU. It will replace the current patchwork of national data protection laws with a single set of rules, enforceable in each EU member state. Increased Territorial Scope - GDPR extends jurisdiction to all companies processing personal data of Data Subjects residing in the EU. Companies can be fined of up to 4% of annual global turnover or €20million (whichever is greater) for serious breaches. Companies without their ‘records in order’ (article 28) can be fined 2% of annual global turnover. Companies are no longer able to use long, illegible T&Cs for an individual to request personal information - the process to understand and request information must be made easy. Data Subjects can obtain from Data Controllers, what, why, and how their data is being processed, and for what purpose. The Data Controller must be able to provide a digital copy of personal data, free of charge. Data Subjects are entitled to have their personal data erased (article 17). Data either no longer relevant or Data Subjects withdrawing consent. Data Subjects have the right to receive the personal data stored about them in a common format. Inclusion of data protection should be considered from the onset of the designing of systems (article 23). Data Controllers should hold and process only data that’s absolutely necessary. Due to internal record keeping requirements, Data Protection Officers are mandatory for large scale data processing, or specific data referring to special categories such as criminal convictions and offences. GDPR for your company doesn’t just cover Deskpro, it covers all of the software applications that you use to store personal data about a Data Subject. Which is why we are committed to helping you to reach compliance. Every company that uses Deskpro, including ourselves, will be held accountable to the GDPR. Updating our Data Processing Agreements between Deskpro and you, our customer, to reflect GDPR requirements and ensure data transfer involving storage outside the EU is fully compliant. Providing timely product updates that ensure you have the capability to be compliant when Data Subjects request data to be deleted or removed. How does GDPR affect Deskpro customers across Cloud and On-Premise deployments? 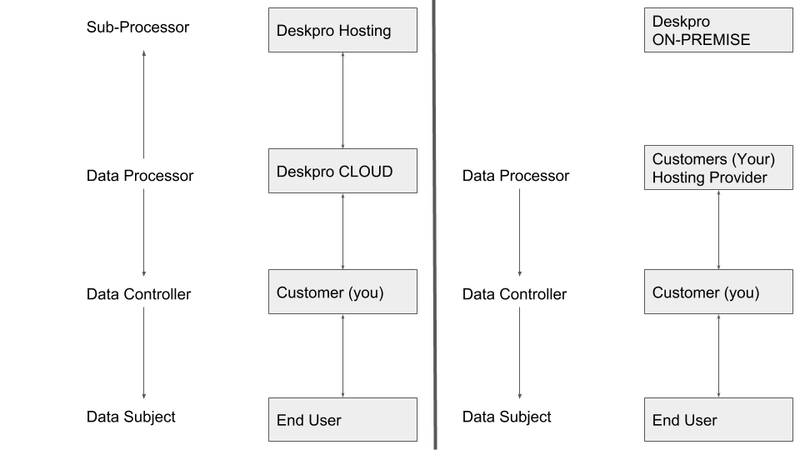 If you use Deskpro On-Premise, your organization is the Data Controller. If you host on your own servers, you are also the Data Processor. If you use a hosting solution, like Amazon Web Services, then they are the Data Processor. If you use Deskpro Cloud, then you are just the Data Controller - and we are the Data Processor. And of course, as a Deskpro customer, you and your organization also qualify as a Data Subject, with Deskpro as the Data Controller, and our third-party hosting provider as the Data Processor. Whilst aligning your business to honour the GDPR may seem like a mammoth task, compliance is absolutely necessary to smooth sailing and success once it is implemented. We will keep you updated over the coming months about changes to the Deskpro product, as well as any legal changes, so that compliance with GDPR is as painless as possible. An individual who is the subject of personal data. Organizations that supply or market goods or services to EU residents. They can also be companies that track or monitor EU residents, deciding how their data is collected and processed. As a customer of Deskpro, you are likely considered a Data Controller under the new GDPR. One of your requirements as a Data Controller is to only work with compliant Data Processors. Organizations that process data on behalf of Data Controllers. As a cloud helpdesk software platform, Deskpro is considered as a Data Processor. However, if you are using an On-Premise deployment of Deskpro, the Data Processor would refer to either your organization or a hosting company. Christmas came a little early for Deskpro this year, as we received news from Deloitte that we’ve been dubbed as one of the fastest-growing technology companies in Europe - as part of their annual Fast 500 rankings. We ranked #338 after growing 348% over the last four years, and we’d like to wholeheartedly thank our customers for being a big part of that journey. The ranking comes at a time where the need for meaningful human customer interactions balanced with highly-automated support is beginning to rapidly increase. As customer support becomes more integral to success for every business, we’ve focused on building helpdesk software that’s easy-to-use, affordable, and ultimately contains more features and functionality than competing products. And that’s exactly what we will continue to do through 2018 and beyond. Recent growth means we’re getting ready to double down on the factors responsible for our success. This largely involves the development and improvement of powerful helpdesk software features that make life easier for you and your teams. We’ve already introduced a whole range of helpdesk updates this year - including the brand new Follow Ups feature this Fall, and a significant improvement on how Snippets work. This is just the start - we have a lot more in store for our customers over the next twelve months, and can’t wait to share what we’ve been working on with you. Done right, though, automation can actually improve your customer experience. This post outlines why and how you should be using helpdesk automation. 1. Your human agents are already busy. Of course, as customers, we all want to feel that an organization we're dealing with offers the "human touch". But your carbon-based helpdesk staff only have so many hours in the day to help customers, and you may not always have as many staff as you'd like. Your helpdesk software can't soothe an angry end-user or troubleshoot a complicated problem, but it can carry out simple tasks instantly. If you're making your agents spend time prioritising incoming tickets, or sending out routine messages that could easily have been automated, you're burning valuable brainpower that could be better spent actually engaging with your customers. 2. Your helpdesk software works 24/7. Most helpdesks can't be open around the clock, so your customers or end-users will run into problems when human help is unavailable. Automated responses can reassure a worried customer that you've received their ticket, set expectations for an answer, and even solve the problem by pointing to self-help content like FAQs and troubleshooting guides. Even if you have the resources to have some agents cover out out-of-hours tickets, or hire agents in multiple time zones, automating business rules is important to avoid confusion between agents from different shifts or locations. 3. Users just want to solve their problem and move on with their lives. Lately it's become fashionable for #custserv experts to extol the virtues of surprising and delighting your customers, exceeding their expectations and generally rocking their world. But some research indicates that, in reality, customers who have their expectations exceeded aren't any more loyal than those who were simply satisfied. What really drives customers away is the perceived effort of a transaction: if customers need to contact you multiple times, wait a long time or explain themselves to multiple different agents to get an answer, they will be much more likely to stop using your service. If this research is right, it makes sense to invest in automation to solve the customer's problem faster and with less effort on their part. 1. Busywork tasks that don't require any decision-making from agents, just time and mindless clicking. Are you making agents go through old tickets to mark them resolved? Automate it! Even if each agent only spends 5 minutes a day on busywork, over a year, that adds up to two working days wasted: time that would be better spent on actual customer service. Your QA team suggests you follow up on resolved tickets where the user gave a bad rating but no comment, and ask them for more information in exchange for a discount coupon. Great idea, but there are so many open tickets to get through... This is the kind of idea you shoud automate. 3. Business rules that sometimes don't get followed. Are you relying on agents to remember to carry out rules like "always copy in manager B on tickets from organization C"? Automate it! Sometimes a rule like this requires human judgement, but still requires the agent to carry out several steps once the decision is made. Explore the use of macros or triggers to speed up the process, so the agent makes the decision, clicks once, and moves on. A well-designed helpdesk software platform will offer you a wide range of flexible automation options. Even fairly complex rules can be automated, as long as you can boil them down to combinations of ticket and user properties. 1. Follow up if a user stops replying. When a user stops replying without confirming that the problem is resolved, it's a good idea to follow up and check what happened. Did they not answer because your last response solved their issue, or because they've been busy, forgotten about it, or given up in despair? You should send a custom follow-up email once you've been waiting for the user for, say, a week, and prompt them to reply again or mark the ticket solved. This lets the customer now you're dedicated to making sure their problem is really solved. It also avoids tickets hanging around in limbo for too long, needlessly driving up your average ticket resolution time. 2. Let users know that their ticket is being dealt with by a real person. Often there's an unavoidable delay between a user creating a ticket and the first reply from an agent. Between these two events, the ticket will usually be assigned to an agent. You can use automation to inform the user when this happens, providing reassurance that the ticket they sent hasn't disappeared into the ether. You probably don't want to send an email every time the ticket is assigned to a different agent, though, just the first time. 3. Filter bounce messages and 'out-of-office' replies. Inevitably, automatic messages get turned into tickets. Deleting these is busywork and should be easy to automate using title matching. A more advanced helpdesk may even include automatic detection of bounces and automated messages to make it even easier to set up the automation. 4. Answer tickets before they're created. Any modern helpdesk software platform will offer a ticket deflection feature, which shows customers suggested solutions based on their query. This requires some investment of time to build up your Knowledgebase, but even a few hours spent writing up answers to your top 10 most common questions will quickly pay off. 5. Hand out tickets evenly. How do you decide which agent takes which ticket? Sometimes the ticket properties will tell you that it needs to be passed to a certain agent or team (automatically, of course), but what if this isn't possible? Either a senior agent can spend time assigning tickets manually, or you can let agents take tickets for themselves, which will naturally tempt them to cherry-pick the easiest problems. With 'round-robin' automation, you can define a queue of agents, and each new ticket is assigned to the next agent in the queue, until the end is reached and the round robin begins again. The effect is that incoming tickets are handed out evenly and fairly. Agents always have a queue of problems to solve, and don't spend time wondering which one to tackle next. Always test your automation from the customer's point of view. Be sensitive to email frequency: unless emails are directly related to something the customer just did, space them out to avoid sending a flood of surveys and reminders all on the same day. Make sure that you send all automated messages with a From: address that goes back into your helpdesk, and let users know they can reply to you if needed. It's easy to get carried away with the possibilities of automation and over-complicate things. Before you implement an idea, make sure you're addressing a real problem. Even better, get your agents to suggest boring tasks they'd like to automate, and ask customers about gaps in your communication. If you hear the same suggestion from multiple people, you know it's time to get automating. Great helpdesk software is essential if you’re in the business of solving people’s problems (and obviously, here at DeskPRO, we have strong feelings about which helpdesk software is the greatest). But whether you’re using your helpdesk for customer service or IT support, great software can’t solve problems on its own. Poorly planned deployment or bad policies can make life miserable for users and agents alike. For this post, we've interviewed agents and end-users from several organizations (none of which are DeskPRO customers, incidentally) about their experience of badly managed helpdesks. Here are some pitfalls to avoid if you’re contemplating a new helpdesk rollout. And if you’re already running a helpdesk, make sure you’re not doing any of these things. Modern helpdesk platforms are sophisticated pieces of software. Before making your agents do something the hard way, it’s worth spending some time exploring what your helpdesk can do for you automatically. Jane* works for a professional accreditation body. When we switched to using a Cloud helpdesk platform, nobody knew we could email back by replying to a ticket from the helpdesk interface. So we kept on replying to clients in our email clients, but then we’d have to go to the helpdesk and type in that we’d received an email, enter all the user’s details and describe the email we’d written. Installing the helpdesk was supposed to track how much time we spent helping clients. Instead, it ended up increasing our workload. It took months before some senior staff went on a training course and found out that we could make the helpdesk convert user emails directly to tickets. Not only is this a terrible way to use any helpdesk platform, but the organization failed to train the front-line agents in the software, so they didn’t realize the problem. Make sure that it’s easy for your agents to access manuals and help guides. It can sometimes be a struggle to get users to give you all the information you need to resolve an issue - but some helpdesks have the opposite problem. Patricia* works for a large government department. When a printer breaks down, the IT helpdesk always insists on ￼￼taking all of my details, including my PC tracking number. Even if it’s a shared network printer, and it isn’t working from any PC. Calling to report something simple like ‘the printer on the 4th floor isn’t working’ can take upwards of ten minutes. The helpdesk even insists on taking down instructions on how to access my building - even though they’re in the same building. The result is that printers stay broken for weeks before somebody bites the bullet and reports the problem. This isn’t a problem that’s confined to big government. We’ve heard of companies asking for all sorts of irrelevant information before they’ll answer the simplest questions. Maybe some of this data-gathering is because helpdesks are under pressure to prove they’re helping real users rather than making them up. Maybe it’s sometimes a cynical way to manage demand, by making the process of asking for help so onerous that users avoid it unless they’re desperate. DeskPRO lets you add custom fields to store useful information about a ticket, but crucially, you can always make a field optional. Think carefully about how much compulsory information you demand from users before you help them. There's no point investing in helpdesk software to manage your customer communications if you don't communicate through the helpdesk. Tom* worked in a company that provided IT services for finance professionals, some of them very demanding. Customers would try to get around our helpdesk ticketing system constantly. They’d find our direct email addresses from the website, ￼￼￼￼￼or email staff members they’d dealt with previously, even if their query wasn’t something that member of staff could help with. They thought that going outside the helpdesk would get them quicker service. It actually didn’t, because we were told to deal with everything in strict chronological order. It just wasted our time going back and forth between the helpdesk and emails. Management wouldn’t let us make it clear that support requests had to go to the official help address, for fear of angering customers. This is a tricky situation. The key is to make clear to users that it’s in their own best interests to go through your standard support process, without offending them. DeskPRO can help resolve this issue using its inbound ticket forwarding feature. This means that your agents can just forward emails from users to the helpdesk email address; DeskPRO is smart enough to create a ticket as if the user had emailed the correct address in the first place. Once customers see that their emails always end up as tickets that can be dealt with by any agent, they will be less likely to try to jump the queue. When you phone up to report a problem, you become the “owner” of that problem whether you like it or not. So you could be about to move a new team member into a vacant desk, but notice that the phone at that desk has stopped working. So you contact the helpdesk and provide all your details - and boom, you are in charge ￼￼￼￼of the broken phone problem. In the case of the printer, I had raised the issue right before going on holiday for two weeks. Even though they’d taken the number for my Blackberry, they never called it. Apparently, talking about a broken network printer was too sensitive for anything but a landline. So because they couldn’t reach me, they closed the ticket. There’s a number of things that have gone wrong here: the reliance on phone calls when an email would do, for one. And while it makes sense that a ticket should have an owner, why couldn’t this helpdesk change the owner when necessary? Was it an inflexible policy, or badly-designed software? Jane’s helpdesk ran into trouble with the wording of an automated email. Our helpdesk sends out an automatic message to our clients which says: ‘This ticket has been allocated to <currently assigned>’. Our clients are older professionals, not web natives, and they find this completely confusing. Many of them don’t realize the email is generated by software, or think it means they need to do something to assign a ticket. The wording should make clear that you don’t have to do anything. Put yourself in the user’s shoes and check that all your emails, forms and other user-facing copy make sense to them. Don’t refer to your internal terminology or processes unless it’s something the user needs to know about. (Plus, make sure you pick a helpdesk with a flexible template system so you can customize all user-facing text). While helpdesk agents should have the writing skills to clearly explain solutions, nothing beats showing the customer what to do. Customer service experts emphasize the importance of resolving problems with the first message (so-called first contact resolution). Every time one of your agents types out a description of a software interface, or tries to describe how to assemble a physical product, there's a chance of miscommunication. It's much clearer to use an image to show an answer, and once you have the right processes set up, adding a screenshot can be accomplished in seconds. In this post, we'll explore some of the best practices for using images to help your customers. most OSes have limited options for the screen area that gets captured. when you've taken the screenshot, most OSes provide very limited annotation tools. older versions of Windows will save screen grabs in the antiquated BMP format. It's best to find software which minimizes the overhead involved in taking a screenshot. You don't need to buy screen capture software for all your agents. There are several free and high quality screen capture utilities available. can be readied to take a screenshot with a keyboard shortcut. enables you to select a custom capture area instead of a whole screen or window; this saves time as agents don't have to crop the image afterwards. saves images in PNG format; JPEG compression tends to produce a blurring effect on text. For Windows, a good option is Greenshot. use simple annotations to highlight actions the user needs to take; add bold arrows or circles for clarity. taking a minute to "proof-read" an image is as important as it is with text; if the user has to change four settings and you only highlight three of them, they will miss the fourth, even if it shows the correct value. Don't forget that showing an image isn't enough on its own if the user doesn't understand the context or purpose of what you're showing them. Make sure images are supported by text. Once your agents have captured a screenshot, or taken a picture of a physical product, make sure it's easy for them to share it with customers. DeskPRO is designed to make this process easy. For example, you can paste a screengrab right into a ticket reply with the usual 'paste' keyboard shortcut. You can also drag and drop images from the agent's desktop to the helpdesk. Ensure that your helpdesk platform makes it easy for customers to send you images. Does the ticket form support sending an image attachment? Can users send an image during live chat? When a customer emails you an image, is it included in the resulting ticket? (In case you're wondering, DeskPRO does all of these). You should encourage your customers to send images whenever it helps you to solve their problem. Even if you're supporting a physical product, most users will be able to use their smartphone to snap a picture and email it to your support address. On the part of your website where your user can look up your support email or submit a ticket, consider including text to encourage taking a screenshot. If your helpdesk platform supports custom forms for different ticket types, you could display this suggestion only for problems/products where an image is likely to help. Emphasise that sending an image will make it faster for you to diagnose the problem - the prospect of a quick solution will motivate customers to overcome the hassle of taking the screenshot or photo. If your user base is less technically inclined, you should add a Knowledgebase article explaining how to take a screenshot on whichever platforms you support. No matter how much you streamline the process, producing a good image to illustrate a particular solution can take time. Promote image re-use among agents by training them to use your helpdesk software's 'snippet' or 'canned answer' functionality to build up a shared library of images that are easy to browse and insert. If you have a frequently asked question with a complicated answer that is best answered with text and a series of images, write it up as a Knowledgebase article, and link to that instead. a physical product that requires a specific movement to use or assemble - "there's a knack to it"
Embedded video is one way to provide a solution to these sort of issues. However, playing a video can cause technical issues for users, and producing a professional video with a good voiceover is time-consuming and expensive. Animated GIFs are ideal for getting the point across quickly where a still image won't cut it. Making a GIF requires a slightly more elaborate production process than taking a screenshot. You'll need to capture a video of the process first, then convert it to GIF. If you want to streamline the process of making GIFs as much as possible, consider investing in commercial software that can capture video and export to GIF, like TechSmith Camtasia. However, there's plenty of free software to capture video of your desktop, and you can make GIFs with the free Windows/Mac software Instagiffer. Don't send GIFs in user replies, since most email clients will not play them. Instead, link to a Knowledgebase article that contains the GIF. The GIF format is very widely supported, but inefficient, so watch the file size; crop the source video or the GIF to make sure you only include the most relevant screen area. Long, complicated procedures are best left for an embedded video, where you can also add a voiceover.